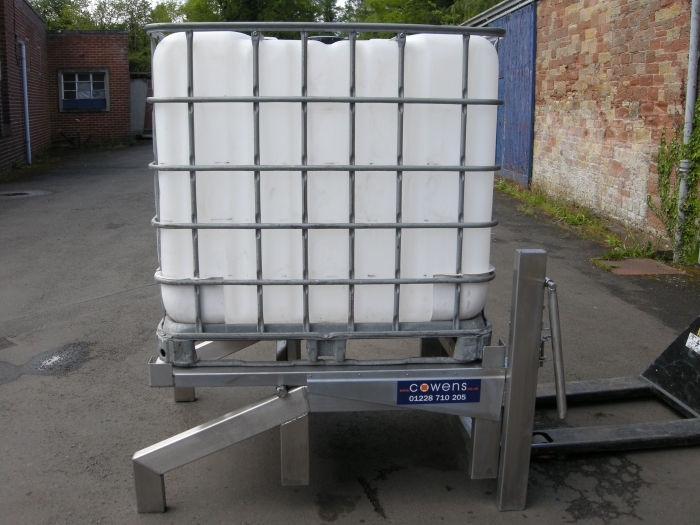 This unique device is used for emptying IBCs down to 5 litres. Left standing horizontally, air will be entrained in the liquid contents when about 100 litres are still remaining, rendering the IBC spent for many food grade or pumped applications. This is because of the height of the off take port from the base of the IBC. 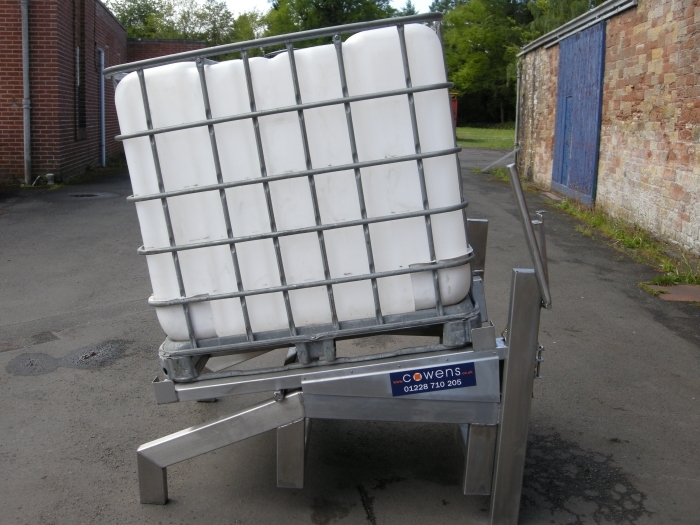 An IBC stand – move the IBC with fork lift truck or pallet truck with the IBC securely located on the stillage, locked in the horizontal position. 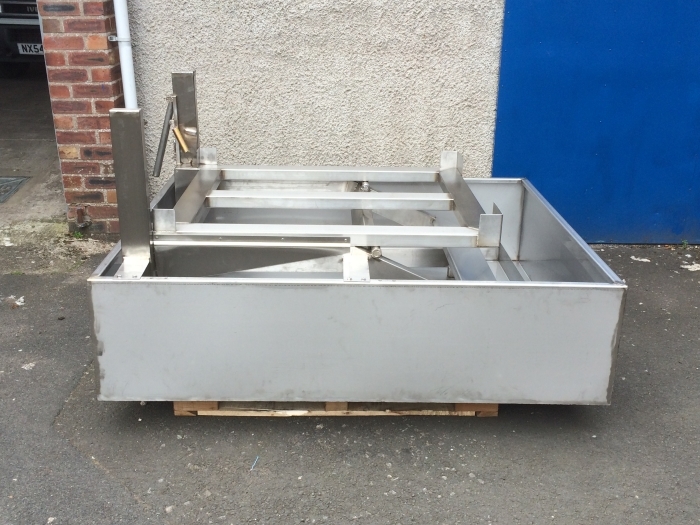 An IBC platform – raises the IBC 555mm to allow for positive feed pressure to pumps etc. Heights up to 1500mm available. A tilting platform – when connected to the off take hose, release the spring loaded mechanism. When full, the IBC remains horizontal, keeping the whole unit stable. As the contents reduce to about 150 litres, the platform slowly tilts forward, keeping the off take port covered. Trials have shown that only 5 litres of product remain compared to 100 litres+ without the tilt. 95%+ reduction in product wastage. 95%+ reduction in product waste disposal costs. A safe elevated platform instead of stacking on pallets to provide pump suction head. Fully mobile enabling lift access and cross-site transportation as well as static storage. 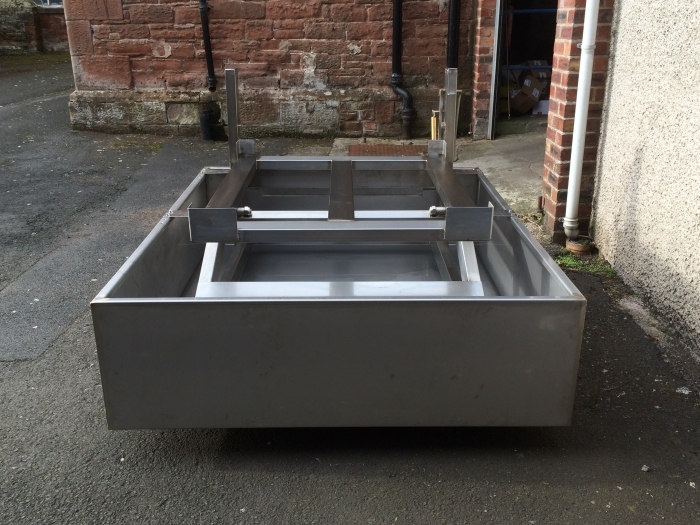 Available in full food grade stainless steel including frame, fittings and spring. Painted steel also alternative. Due to the fulcrum position, the spring strength is under 20kg, enabling one man, one handed operation. A locking position disengages spring and locks platform in the horizontal position for transporting. IBC corner locators prevent IBC movement even under sudden braking. Item has been risk assessed by us and our customers and passed safe to use.